Walking J Ranch - Santa Cruz County, AZ - Headquarters West Ltd. The Walking J is located 12.5 miles southeast of Patagonia, Arizona in Santa Cruz County’s exclusive and beautiful San Rafael Valley. From Patagonia, the driving distance to the ranch is about seventeen miles. From Sonoita, traveling through Canelo Pass, it is about 28.5 miles to the ranch house. 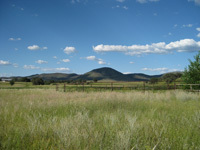 The Walking J Ranch is a two hundred acre parcel of prime Southeastern Arizona grazing land. The ranch’s topography is gently rolling, and varies from large, open, grassy swales to oak tree-studded hills along its boundary with the Coronado National Forest. Cherry Creek and several of its tributaries pass through the Walking J on their way to the Santa Cruz River. The Walking J enjoys a high degree of privacy, beauty, and spectacular views. The general elevation of the ranch is 4,900 feet above sea level. Its climate is exceptional for year-round living, ranching, and recreation. Summers and winters are relatively mild, and annual rainfall usually ranges between 14 and 16 inches. Summer daytime temperatures seldom reach 100º F, and generally run in the upper 80’s and lower 90’s; summer nights are cool. Winter days are pleasant, with afternoon temperatures usually in the 60’s and, occasionally, in the 70’s and even the lower 80’s. From November through March, nights frequently bring temperatures below freezing in the early hours of the morning. Occasionally, there is snow. 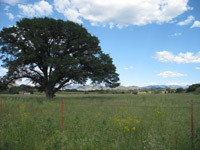 Predominantly rolling grassland, there is a strong variety of grasses, forbs, shrubs and trees on the Walking J Ranch. Outstanding perennial grasses include blue grama, sideoats grama, hairy grama, sprucetop grama, plains lovegrass, green sprangletop, vine mesquite, Texas timothy, curly mesquite, cane beardgrass, and several others. A few good annuals are also present in the plant community. Shrubby species include cliff rose, manzanita, mountain mahogany, ceanothus, and mountain laurel. Blue, white, and Emory oak trees, as well as alligator juniper trees, can be found in considerable numbers on the property. Some of the trees are very large. The primary ranch improvement is a combination ranch house and shop. Construction of the large shop that included an apartment began in 1999. In 2006, the living facilities were expanded. Straw bale construction was employed for the exterior walls of the addition, and ducting was installed for delivering air conditioning by forced air gas. Radiant heating was employed in the floors of the addition. For a while, the ranch was the home of Coronado Outfitters. A number of organized trail rides were successfully hosted at the ranch. Among the improvements that were built to accommodate trail riders was a large, steel ramada at the site of the principal campground. Additional improvements include pipelines for water delivery to various points on the ranch, a small set of steel corrals, and pasture division fences. Water is supplied by a private well on the ranch. Electrical power is supplied by Unisource; telephone service is provided by Qwest. High speed internet is available on the property. Sewage treatment and disposal is accomplished by septic tank and leaching field. Elementary school education is provided by the Patagonia Elementary School. High school students attend the Patagonia Union High School. Both schools are located in Patagonia; the school district provides bus service to the San Rafael Valley. The Walking J Ranch is for sale for $2,000,000 cash, or present terms offer.